Kinergy Health took home the top prize of $25,000 in the Patient Engagement Blue Button Challenge sponsored by The Advisory Board Company. The objective of the Patient Engagement challenge was to create a consumer application that will enable the greatest number of individuals to make Blue Button data available to hospitals and physicians. 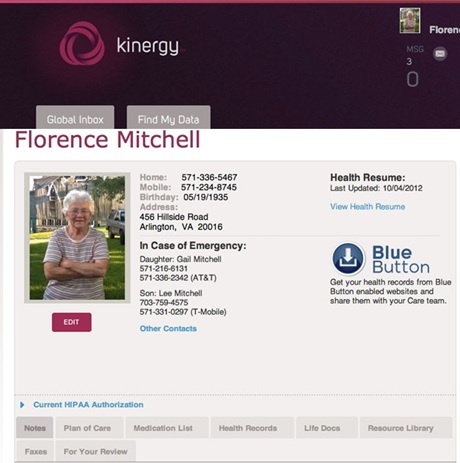 Kinergy provides a secure, cloud-based environment to communicate between caregivers, families, and providers. “Kinergy outperformed our other high-quality finalists in its ability to engage patients and the medical staff, resulting in a level of trust that led providers to actively encourage patients to enroll,” said Aneesh Chopra, former U.S. chief technology officer and current senior advisor for health care technology strategy at The Advisory Board Company. Kinergy partnered with Lynchburg Internal Medicine (LIM), a member of the Centra Medical Group. “The Lynchburg Internal Medicine physicians were excited about the usefulness of this data, especially for their population of veterans,” said Terri M. Ripley, director of systems and programming and American Recovery and Reinvestment Act coordinator for Centra, a regional nonprofit health care system. Judges evaluated entrants on three criteria: basic functionality and security; the ease of accessing, updating, and sharing patient information for both patients and providers; and the ease of integrating this information into the clinical setting. The finalists and winner were selected by a panel of five judges: David Chao; Aneesh Chopra; Dr. John Halamka, chief information officer at Beth Israel Deaconess Medical Center and a professor of medicine at Harvard Medical School; Dr. Jeffrey DiLisi, vice president and chief medical officer at Virginia Hospital Center; and Halle Tecco, chief executive officer of startup accelerator, Rock Health. FollowMyHealth™, submitted by Jardogs, LLC, Springfield, Ill.
MyKinergy, submitted by Kinergy Health, Vienna, Va.